Process Builder has become my bread and butter. I like to call it my “PB sandwich.” I’ve only come across a couple of situations where an issue or automation couldn’t be solved with Process Builder. And since I am building and configuring in there all day, I’ve come to realize that sometimes I use bad building “grammar” and make it harder on myself to see what I’ve just built. So here are some tips to keep your PB sandwich neat and tidy, rather than a big mess of stickiness. First things first: Come up with a process naming convention. Your process names should be short but precise! Short because in the “view all processes” screen Salesforce only gives you a short amount of space for the name and you’ll want to be able to read most, if not all, of it. Secondly, your process name needs to be precise because there may be 20 processes and you’ll want to know what each one does without having to open it up. That is also why filling in the description of the process is a best practice. Again, keep it simple and straightforward. And as you clone and modify, be sure to update your process description so the version control of your PB sandwich doesn’t transform it into a Sloppy Joe. Keep those process names short and to the point! Criteria diamonds that feature questions make Process Builder flow easy to navigate. If you are not specific enough in labeling your action, you’ll inevitably find yourself constantly opening up the action to see what is going to happen. And that’s just messy and wastes time. If you name your actions to, again, be short but precise, you will save yourself time and energy. For example, I could easily name my action “Update Contact Record,” but that doesn’t tell me what in the Contact record is being updated, and I’ll definitely need to open up the action to see what is happening. Instead, if I used “Funnel Fields = Active,” I know exactly which fields are being changed and how they are being changed. Be specific when labeling actions! Be nice to your process from the beginning by building it with clear language and correct grammar. If you keep your PB sandwich clean and organized from the get-go, you will save yourself, and others, a lot of time and energy and avoid a messy clean-up. Got other Process Builder best practices to share with us and our readers? Go ahead and leave a comment below–we look forward to getting your insight! 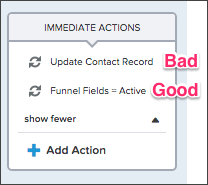 And for more Process Builder tips from me, check out past blog posts like this one on some awesome updates they made last year and this one on joined reports.